Getting baby in and out is hassle-free! Move the hanging baby toys to the appropriate distance from baby's palm, so that when they raise their hand - they can hit the toy, or later, grasp it with ease. 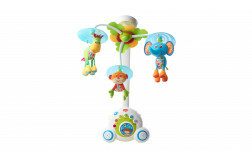 Moderate the level of stimulation offered by the Gymini Move & Play by moving the arches and toys away or towards baby and turning the lights & music feature on or off. If baby seems uncomfortable or restless (cries or averts her gaze) reduce the level of stimulation. Leave only one toy in her field of vision, push the arch connector aside and try turning the music off. Stay beside your baby and stroke her gently until she is soothed. If baby seem uninterested or bored, he might need more stimulation. Activate the lights & music toy and watch his reaction. 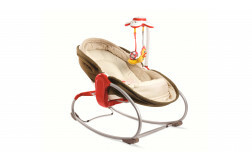 Hang up some extra toys on the arches, rattle the toys and see how baby reacts to the noise. 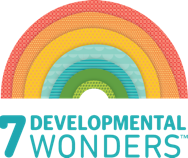 Gradually, reduce the number of stimuli to help baby focus. To stimulate baby’s body sensation and control, place him on his tummy. Tummy time helps babies gain control over their muscles and movement. 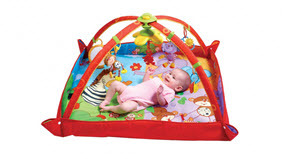 Move the arches so that the lights & music toy or mirror are in front of baby. Monitor baby’s reactions and try to see which features he enjoys and which he could do without.